First established by entrepreneur Kenneth Wood in 1947, Kenwood have been providing savvy consumers with outstanding kitchen appliances for over half a century. Every product in the Kenwood range is distinguished by its superior quality, excellent design and ease of use. When you’re using a Kenwood, you can rest assured that you’re using the best. 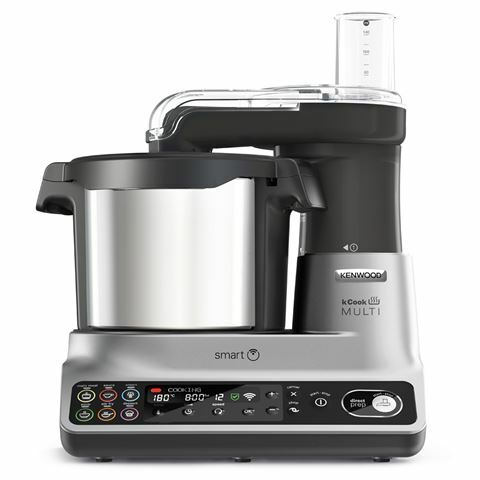 Uncover a state-of-the-art cooking experience with Kenwood’s new kCook Multi Smart. This multi-purpose device can be controlled from your smartphone thanks to the Kenwood World app, guiding you through the entire cooking process. Boasting an impressive 1500 watts of heating power it comes with an extra-large bowl that’s perfect for families and ensures everything you cook – be it a stew or some Bolognese – is cooked to perfection. Equipped with six pre-set cooking programs for a variety of cooking styles, this impressive piece features interactive weighing scales for precise measuring, while the incorporated direct prep section of the kCook Multi Smart lets you slice and grate straight into your prep bowl. 1500 watts of heating power. Can be controlled directly through the Kenwood World app – simply download the Kenwood World app onto your smartphone or tablet for step-by-step, app-controlled cooking. Use the app to swap out ingredients, so you can tailor their various recipes to your tastes. Large 4.5 litre stainless steel bowl is perfect for families. Six pre-set programs – Main Menu, Sauce, Steam, Soup, Stir Fry and Dessert. Additional warm and timer functions. Temperature range of 30°C to 180°C with 1 degree increments. 7.2 litre two-tier steaming tray is perfect for dumplings and vegetables. Direct prep section lets you slice and dice straight into your prep bowl. Includes various discs for different slicing results. Bluetooth-connected weighing scales will display the weight of your ingredients directly to the Kenwood World app. Includes a spatula, stirring tool and other attachments. Presented in a Kenwood box. 4.5L Stainless Steel Mixing Bowl. 7.2L Stainless Steel Two-Tier Steaming Tray. Dimensions: 33.5cm (l) x 29cm (h) x 26cm (w).